Find the right card using our powerful in-app search engine. Get instant deck statistics, mana curves, test sample draws and more! Easily input and keep track of your cards. Quickly find missing cards that your decks require and estimate the value of your collection. Our Card Cam technology will allow you to recognize cards using your web cam. Easily input your decks and collections without typing! Anytime, anywhere – no internet required! Find text, name, abilities, type & more! Examine your deck from different viewpoints: mana cost, color, card type and more! Does your deck mulligan well? Do you have enough mana sources? How quickly you can deal 20? Price your cards and decks through one of many available vendors: Cardshark, TCGplayer, MagicCardMarket.eu and more! 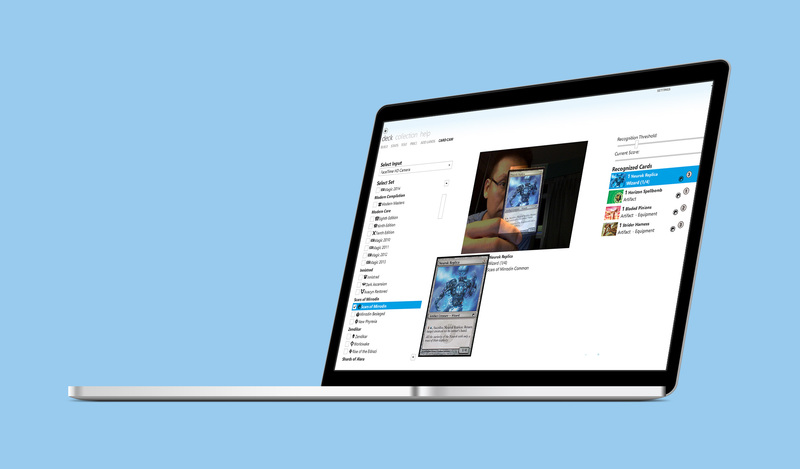 If you buy the Card Cam add on, adding cards to your collection or deck is easier than ever! Just swipe the card in front of your webcam. 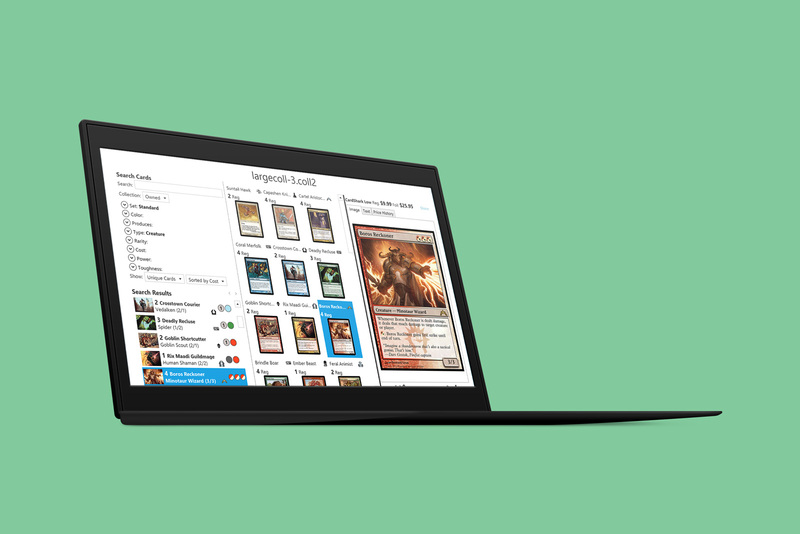 Take your deck and collection with you on your Android, iPhone, iPad or Mac! Hear what others have to say about our software. This is the program I recommend for anyone willing to spend … on an MtG application. I’m one of those people who will generally take the free alternative over the paid app any day, but I’m actually happy to have spent the money on this one. It has a ton of very cool features, runs smoothly, and even has RSS feeds for several top MtG sites. You can find Decked Builder on the iTunes App Store here for $5.99 on iPad (Requires iOS 5.1), and here for $3.99 on iPhone and iPod Touch (Requires iOS 4.0). If you think it’s pricey, consider that I bought this app and use it on my iPhone and iPad. Yes, I bought it twice; it’s THAT good. Start Building Decks with Decked Builder for Windows Today! Find out more about our other deck building products at www.deckedbuilder.com. Learn to draft better with Decked Drafter! 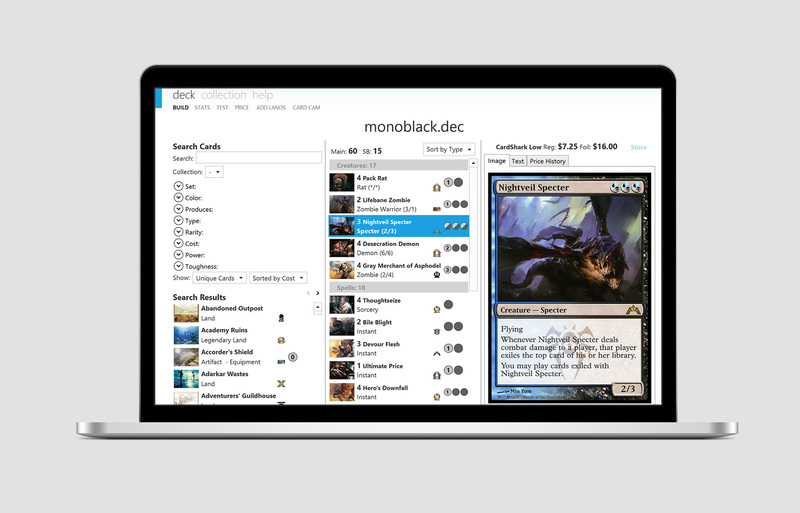 Decked Builder produces a suite of cross platform products for building and drafting Magic: the Gathering. You can contact us via email at [email protected]. Decked Builder is not affiliated with, endorsed, sponsored, or specifically approved by Wizards of the Coast LLC. This website may use the trademarks and other intellectual property of Wizards of the Coast LLC, which is permitted under Wizards’ Fan Site Policy. Wizards of the Coast, Magic: The Gathering, and their logos are trademarks of Wizards of the Coast LLC in the United States and other countries. Copyright Wizards. All Rights Reserved.